Southeast Asians are spending more on Valentine’s Day, with new research confirming that the most romantic day of the year is becoming increasingly commercialised. 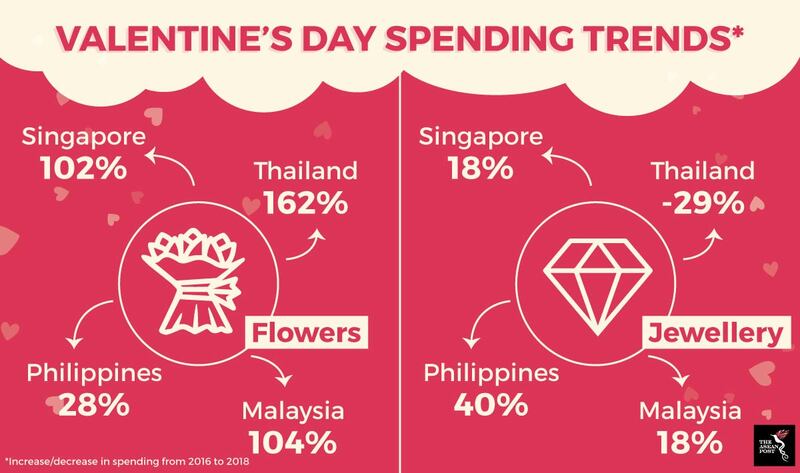 The 2019 Mastercard Love Index released yesterday reveals that Asia Pacific leads the world when it comes to growth in sentimental spending for Valentine’s Day. Compared to 2016, Asians spent 33 percent more on their loved one in 2018 – with the overall number of transactions up by 37 percent. In contrast, sentimental spending in the United States dropped by eight percent during the same period. Now in its fourth year, the annual study was created by specifically analysing credit, debit and prepaid card transactions from 11-14 February over a three-year period (2016-2018). The report defined sentimental spending as all spending on restaurants, hotels, transportation, jewellery, books, records and stationery during the four-day span. Sentimental spending has increased across the board in the four Southeast Asian countries in the study; Malaysia, the Philippines, Singapore and Thailand. It rose the most in the Philippines (48 percent), followed by Singapore (28 percent), Thailand (25 percent) and Malaysia (23 percent). Seen as an opportunity to cash in on the public’s infatuation with Valentine’s Day, retailers are constantly creating innovative promotions to attract couples in order to stand out in an increasingly competitive market. Due to increased demand, prices for Valentine’s Day gifts such as roses and chocolates are double or triple during the period – with lovebirds paying a premium to profess their love for one another on this special day. Suppliers have also taken note. For example, Emirates SkyCargo, which is operating nine flights – each capable of transporting 100 tonnes of cargo – just for flowers to meet the increase in demand for Valentine’s Day. This figure is on top of the 4,000 tonnes it transports monthly. Not surprisingly, the Mastercard research has shown that hotels, restaurants, jewellers and florists have all enjoyed an increase in sales when comparing figures from 2016 to 2018. Singapore leads the way in rising hotel spending with 48 percent, followed by Thailand (28 percent), the Philippines (22 percent) and Malaysia (21 percent). The region saw a huge increase in spending on flowers, with Thailand leading the way with 162 percent followed by Malaysia (104 percent), Singapore (102 percent) and Philippines (28 percent). Spending in restaurants rose the most in the Philippines (12 percent), followed by Singapore (eight percent), Thailand (three percent) and Malaysia (two percent). Filipinos also lead the way in increase for spending on jewellery (40 percent), Thailand is second with 29 percent and Singapore and Malaysia both recording 18 percent each. Equally as expected was the rise in e-commerce spending for Valentine’s Day which ranged from seven percent in Thailand to 178 percent in the Philippines. Singapore and Malaysia recorded 48 percent and 55 percent increases, respectively. Although its commercialism and marketing potential is undoubted across the region, the actual celebration of Valentine’s Day is a divisive topic in Southeast Asia. Public displays of affection and promiscuity have been Valentine’s Day critics’ biggest rallying points, and governments have taken different approaches to tackling the issue. In Thailand, Deputy Prime Minister, General Prawit Wongsuwanhas called for stricter supervision of nightclubs and areas where minors and teenagers may gather. In addition, Thai officials are monitoring social media for invitations to illegal activities such as drug parties. Cambodia’s education ministry issued letters to schools warning against “unusual activities”, saying that Valentine’s Day is influencing more youth to forget their studies, dignity and Khmer traditions and values. In Indonesia, the world’s largest Muslim nation, at least 10 cities have imposed partial or full bans on the celebration – with officials confiscating condoms in a bid to prevent promiscuity. Other countries are taking a more relaxed stance. In the Malaysian state of Sabah, the local government there touted a matchmaking competition last year as a means to promote tourism on Valentine’s Day. In Sibu, a town in the neighbouring state of Sarawak, traders have been warned not to hike their prices due to increased demand, with the Ministry of Domestic Trade and Consumer Affairs’ Sibu chief stating they would take action under the Price Control and Anti-Profiteering Act 2011 if they receive complaints from the public. In the Filipino province of Cavite, hundreds of couples will be tying the knot in mass marriages across the province sponsored by local authorities today. Some newlyweds will also be participating in a “best dressed” couple contest to win cash prizes ranging from US$57 to US$191. Jewellers in Vietnam are bracing for a surge in demand for gold today as Valentine’s Day this year falls on the 10th day of the Lunar New Year – the God of Wealth Day. With many believing that buying gold today will bring them luck in the new lunar year, several gold traders have launched new collections and are offering special products. No matter where people are in Southeast Asia, those who celebrate Valentine’s Day will be spoilt for choice with the variety of offerings and promotions being marketed. And with employment and incomes rising across the region, next year’s Mastercard Love Index may well show even healthier spending figures come Valentine’s Day.